2019 is a property tax revaluation year in 27 of North Carolina’s 100 counties. If you are responsible for the property tax function of multiple properties across multiple counties, it is important that you keep track of which counties are revaluing each year since assessment reductions achieved through a successful property tax appeal are not retroactive. Even though you can file appeals in non-revaluation years, your opportunity to maximize potential savings from a property tax appeal is dependent upon filing that appeal during a revaluation year. If you manage, own or are responsible for monitoring property tax assessments of real property in any of these 27 counties, keep an eye out for revaluation notices, which should be mailed to the owner of record. Some counties have already begun mailing notices, and most will have done so by March 2019. As soon as the notice is sent out, the period for appealing the proposed valuation begins. Overlooking the revaluation notice is one potential pitfall in the property tax appeals process. 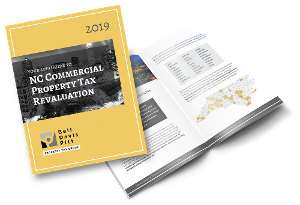 For more information about the commercial property tax appeals process, download our guide to NC Commercial Property Tax Revaluation. Justin focuses his practice on property tax appeals, intellectual property law, tax controversy law, and general business law. He is a regular contributor to both The North Carolina Property Tax Law Monitor and The Trademarketing Blog. You can follow him on Twitter @JustinHardyBDP. The best time to file an appeal of the assessed value of your NC property is in the revaluation year of the applicable county. That’s because reductions are not retroactive — so a reduction resulting from an appeal filed in the year following the revaluation year has lost one full year of potential tax savings. For nine North Carolina counties, 2018 is a property tax revaluation year. For property tax purposes, each county in North Carolina is required to revalue all real property within its borders at least once every eight years. Revaluations for North Carolina's 100 counties are staggered so that not all counties are revaluing during the same year. Some counties elect to revalue property tax more frequently than the 8-year mandate—most commonly every four years. For 24 North Carolina counties, 2017 is a property tax revaluation year. Each county in North Carolina is required to revalue for property tax purposes all real property within its borders at least once every eight years. North Carolina has 100 counties, and their revaluations are staggered so that only some counties are performing a revaluation in any given year.